Kundalini yoga is a pragmatic sacred science based on ancient technologies that are congruent with coherence theories, working, in part, with the electromagnetic fields of psyche and soma (auric fields in yogic terms). Kundalini Yoga works to awaken the energy of consciousness within you. By practicing Kundalini Yoga, you can unite your consciousness with Universal Consciousness; yoga means to yoke or join together. While all yoga is designed to achieve this goal, Kundalini Yoga is transformational and fast acting. Kundalini yoga, as taught by Yogi Bhajan, explained that when the mind concentrates the magnetic field of the psyche, a “zero state” of consciousness is reached, a state of blissful coherence or Shuniya. Instead of using language such as auras and other New Age sounding terms, Kundalini yoga is a pragmatic spiritual science especially suited for the changing times that we find ourselves in. Specific kundalini meditations are targeted to stimulate the vagus nerve and balance the nadis (subtle energy channels) and the autonomic nervous system. Whether you have any knowledge of how Kundalini meditations work or not doesn’t matter, because with continued and regular mediation practice, you can track your own progress with HRV biofeedback and witness your own heart coherence levels improving. Remember that healthy HRV numbers are just a important s other biomarkers that your doctor orders. Kundalini Yoga restructures your nervous and hormonal systems and heals the body-mind naturally from chronic stress. Kundalini Yoga works to repair the automatic rhythm of your breath control (pranayam) so that your mind becomes focused and balanced. When you learn how to gain self-mastery over your breath you have mastered the stress response. It works so effectively and quickly due to the its completeness, energy, and balance. Kundalini Yoga works with the “central tuning string” of the body, the vagus nerve, and brings your body-mind into a state of coherence. It also adjusts the electro-magnetic fields of your body and psyche and aligns you with the stronger electromagnetic forces of the earth, sun, and beyond. It puts you in a state of coherence with the world around you and brings your body into alignment. Kundalini Yoga is a Raj Yoga, or royal path, originally called the science of the serpent power (Kundalini Shakti) draws on the Tantric tradition based on the chakras (vortices of energy along the spinal column and beyond). Kundalini yoga helps heal and rebuild the nervous system so that you build energy reserves instead of running on empty. Your body runs on electricity, from the beat of your heart to cellular metabolism and energy production. When your nervous system is weak from chronic stress, anxiety, and depression you will eventually hit a wall where you may be surviving–barely. As you rebuild your nervous system the glandular system heals as well and you begin to regain joy in your life. I have found that for me it happens slowly over time. One day you may notice that you are no longer reaching for that glass of wine after a tough day at work or feel the need for numbing out with food, shopping, or addiction of choice. Who is Kundalini Yoga For? Kundalini yoga is for everyone, and is a “householder’s yoga,” meaning that it is for people with demanding jobs, families, school, relationships, and busy lives. Simply put, Kundalini yoga is for real people. Whether you are flexible as a pretzel, need to sit in a chair, or somewhere in-between, Kundalini yoga meets you where you are. With patience, practice, and consistency your body and mind will begin to loosen up and become more flexible. Where and When Do I Practice Kundalini Yoga? There is nothing like a live Kundalini Yoga class where you benefit from the energy of the teacher and class. Kundalini Yoga, as taught by Yogi Bhajan, is popular around the globe; see if there is a class near you at the International Kundalini Yoga Teachers Association (IKYTA). 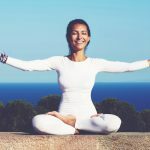 HowToRelieveStressNaturally.com offers online Kundalini yoga classes taught by certified Kundalini Yoga instructor, Dr. Anne Taylor (Harkirat Kaur) broadcast from the HeartPrana Yoga Studio on Camano Island, WA. Always practice Kundalini yoga on an empty stomach and wear loose fitting comfortable clothing. No spandex required. How Does Kundalini Yoga Work? Kundalini yoga works on several levels; it quickly affects your nervous system and quiets down the mind’s chatter and negativity allowing you to experience a sense of calm and grounded-ness. Kundalini yoga is a pragmatic sacred science based on ancient technologies that are congruent with scientific theories such as basic electro-magnetic principles—the play of opposites. Meditations practiced for as little as 3 to 11 minutes a day (11 Minute Meds) begin to affect your nervous and hormonal systems. As your body releases less cortisol and stress hormones, and produces more DHEA and other healing properties. Kundalini yoga balances the nervous and hormonal systems, thus reducing body (somatic) and psychological (psyche) stress. Consistent Kundalini yoga practice leads to psychological/psycho/spiritual healing and transformation. This transformation occurs by shifting awareness from an egocentric way of life to one based on heart-centered living in accord with the Self. In brief, Yogis intuitively know what stage of meditative mind they are in, and yogic masters have the ability to perceive those states in others as well as themselves. Kundalini Yoga follows Patanjali’s Eight Limbs of yoga, and although thousands of years old, Kundalini yoga was only brought to the West in the 1960’s by Yogi Bhajan, master of Kundalini yoga. Prior to that, Kundalini yoga was a closely guarded secret practice taught only by teacher to student through the centuries. Yogi Bhajan, taught students to “use your mind to synchronize your own magnetic field with the cosmic magnetic field, which has a complete interconnection with all other humans, other existences, and realms of material existence” (The Mind: Its projections and multiple facets 8). What To Expect in a Kundalini Yoga Class or Practice? Many people can feel the effects of practicing Kundalini yoga right away. Some experience a mild buzzing or feeling of well-being. If any unpleasant sensations occur, back off on the time duration and ALWAYS follow the sequences of exercises as described. Find a certified Kundalini yoga teacher (KRI) who has been properly trained in teaching the fine points of Kundalini yoga. Breath carries the life force energy, and when you learn how to breath with conscious awareness, you calm your mind and body. We learn to master our emotional states through various breath patterns. A kriya is a set of exercises that are a precise combination of postures (asanas), breathing and sacred sound or mantra. A kriya is a complete system that balanes body, mind, and spirit. You will experience mental clarity, physical vitality, and calmness. Meditation is key component to any Kundalini Yoga class, as taught by Yogi Bhajan. Meditation is a natural antidote to stress and helps replace negative thought patterns with your own positive vibrations. Using mantra (silent or chanting aloud), mudra (hand positions), and eye positions we clear negative patterns of thought and connect with the higher consciousness of the Teacher within. “The beauty of Kundalini Yoga is that in one Kriya (set of exercises) you can immediately achieve a complete physical, mental and spiritual balance. Since any method that assists in helping you achieve Universal Consciousness, from yoga to dance to prayer, ultimately raises your Kundalini to accomplish it, why not go directly to Kundalini Yoga?” – Yogi Bhajan.